The course costs £85 which gives 8 weeks temporary membership at a 20% discount and allows access to any or all of the beginners classes in those eight weeks. It is possible therefore to have up to 36 hours tuition during the course. You will also receive an accompanying course booklet "Fundamentals of Tai Chi Chuan". Participants who complete the course and stay to complete the beginner level will be given a blue polo shirt, embroidered with the club logo. You can pay on line using the Paypal secure payment system. Alternatively pay in class by credit or debit card, cheque or cash. You can register and pay on line with our on line registration and payment form. Payment is via PayPal which handles debit and credit card payments securely, and will send you a receipt for your payment which you should bring with you to the first class. Alternatively you can come along on the open night, or on the first night of the course and fill in the registration form and pay by credit or debit card, cash or cheque. You may also join as a member straight away by downloading a registration form as a printable PDF file that you can either return to us with a cheque for the appropriate amount, or bring with you to the first class. 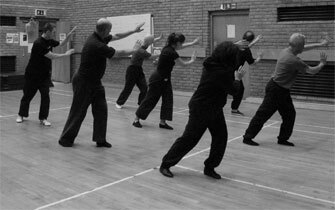 The course allows participants to learn, experience and practice the movements of Tai Chi Chuan and relate them to the underlying theory. 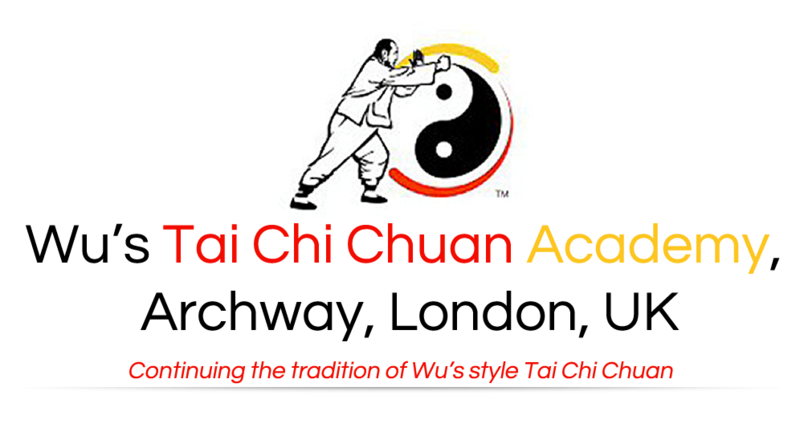 It is ideal for people with little or no experience of Tai Chi Chuan who would like to find out more about Tai Chi Chuan before making a commitment to becoming a full member and learning the art in greater depth. At the end of the course we hope you will be able to perform the sequence of the first 14 forms unprompted and unaided. This is the first section of the long form (108 movements of Wu's style Tai Chi Chuan). At the end of the course you can choose to stay on and complete the beginner's syllabus. A set of simple top to toe exercises to warm up the joints and muscles and stimulate the circulation. An understanding of the philosophy helps explain the rationale of the movements, and why they are structured the way they are. We recommend loose easy fitting clothes that do not restrict movement e.g a Tee or sweat shirt, track suit bottoms and kung fu slippers, trainers or stocking feet are preferred to bare feet. Please note that the cost of the course includes a blue polo shirt embroidered with the Academy logo which is given to members who stay on to learn the remainder of the beginners syllabus. We are located at the Whittington Park Community Association (WPCA), Yerbury Road. Classes are in the Lower Hocking Hall, the entrance is in Rupert road, just before the park entrance. The WPCA is about equidistant between Archway and Tufnell Park Underground stations (5 - 10 minutes walk) and very close (2 - 5 minutes walk) to the North London overground line (Gospel Oak to Barking branch). 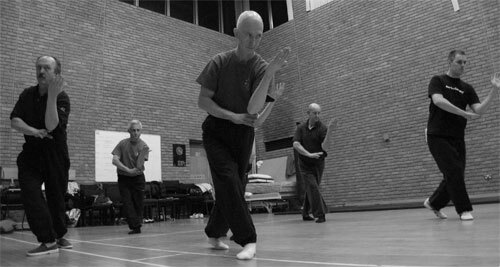 The aim of the course is to introduce people to Tai Chi so they can see whether or not they like it, and would like to continue learning and practicing. The course covers only the first 14 of the 108 movements of the hand form, there is a lot more to learn, but what you learn on the course provides a sound basis for further study. At the end of the course you will be asked if you wish to stay at the academy and continue learning. If you decide to stay after the course you will be asked to pay the annual membership fee (£25) and the monthly subscription (£55 by standing order or £65 by cash or cheque) for which you may attend any or all of the beginner's classes available. The payment for the course is non-refundable. However if your circumstances change or you are unable to complete the course, any unused classes can be held in credit for up to a year. So, for instance if you book and pay for the course and then have to drop out after 2 weeks for whatever reason, you can take up the remaining six lessons at any time in the year from the start of the course. Alternatively pay the pro rata sum for the previously taken lessons and rejoin for a full eight week course from lesson 1.